This bodysuit features a V-neckline and backline with a lace-up design and is perfect for a romantic date night or a girls night out. A piece you will carry through all four seasons! 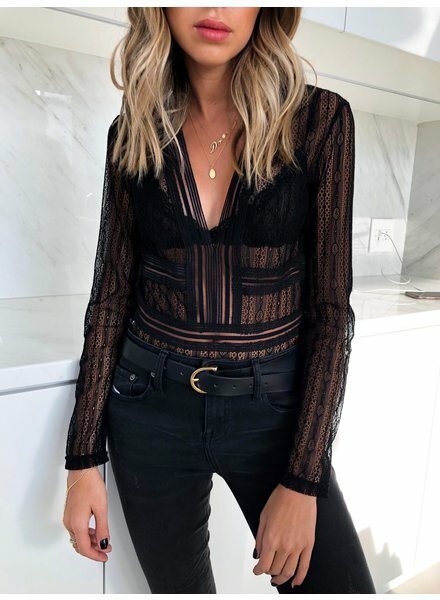 This bodysuit features a V-neckline and backline with a lace-up design and is perfect for a romantic date night or a girls night out. A piece you will carry through all 4 seasons! This bodysuit features a V-neckline with a lace-up design and is perfect for a romantic date night or a girls night. Pair with your fave pair of black jeans and you're all set! Show some shoulder with this sophisticated bodysuit! Step your outfit game up a notch with the Piped Wide Leg Pants. These ultra classy silky pants have a wide leg fit and piping detail down the side. Pair with a simple bodysuit and heels for a night out. Model is wearing size small. Can't get enough of stripe detailing and this bodysuit is no exception! This ribbed bodysuit features red stripe detailing down both sides. Adjustable straps. Snap closure bottom. 95% Cotton 5% Spandex Model is wearing size small.